Those who know Nottingham well, will be familiar with the images below. However, those who are unfamiliar with the City will get a glimpse of what is on offer. The Nottingham sculptor, Robert Stubley, is all for more public art, and says, "I worked on the continent and it's everywhere. It's just fantastic. It just makes the place different somehow". This blog in not unique; it follows in the footsteps of many others that have shown these images of Nottingham, but I just wanted to show some of the public art that meant something to me. Some of the photos were taken with my phone camera, and the quality is not that great; others have been legitimately copied off other sites. I know that technically, some of the images may not be public art, but hey, I'm not a professional, and I enjoy them, so look, enjoy and explore for yourself when you get the chance. 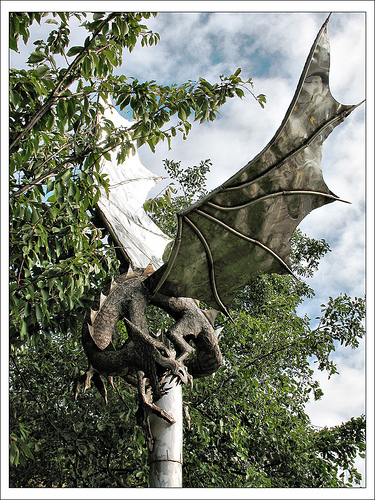 This steel dragon is seven feet high, with a wing span of fifteen feet, and was the work of Robert Stubley. 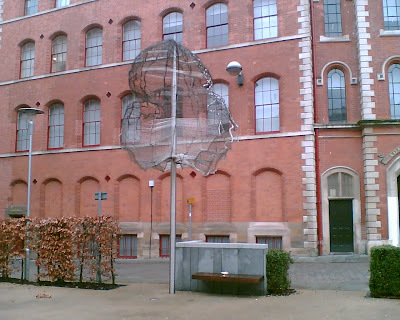 It was unveiled at the corner of Manvers Street and Sneinton Hermitage in November 2006. The choice of a dragon was the result of history. In 1914, Robert Mellors wrote about Sneinton in its poverty ridden years. "For more than half a century there has existed in certain parts of Nottingham a monster who has devoured in the first year of their lives a large number of infants, and, what is worse, probably an equal number who have survived have dragged out a pitiable existence in weakness, small in stature, deformed, or anaemic, with diseases, lack of energy, unable to maintain themselves, and therefore dependent on others or the public charge; and, worse still, some have had a natural tendency to vice or crime. Who is this monster, and what is his name? His name is SLUM". The Sky Mirror was designed by the world famous sculptor, Anish Kapoor, and was unveiled in 2000. 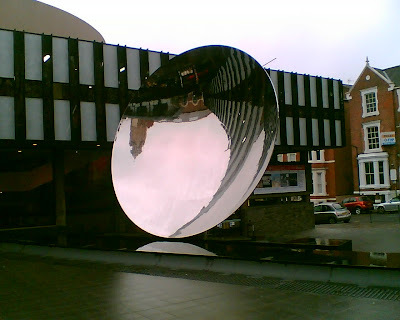 It is made of stainless steel, and sits outside The Nottingham Playhouse. 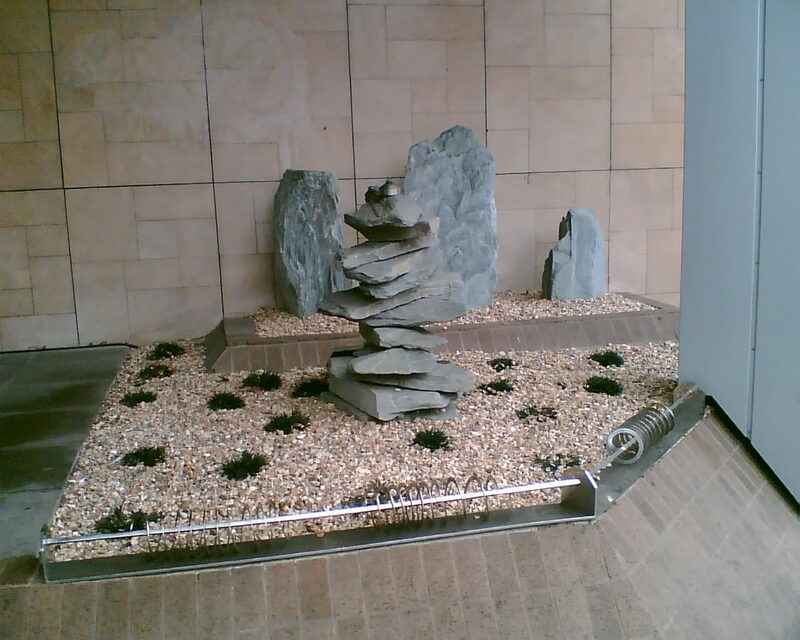 To give an idea of the size, it is 5.75 x 5.75 x 1.08 metres, and is designed to reflect the sky and surroundings. 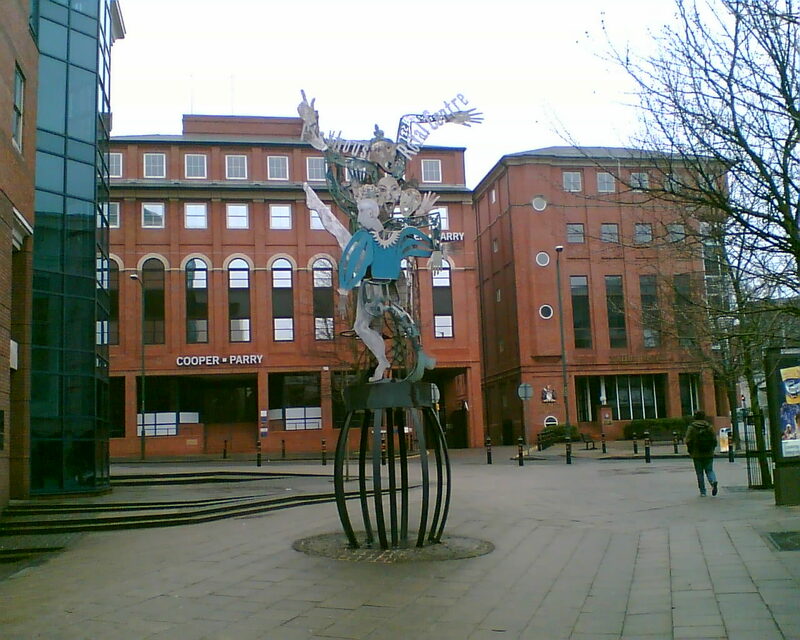 This piece of art on Maid Marian Way is a directional sign to the Nottingham Playhouse to the left, and the Royal Centre to the right. I can find very little information about it, so if you know who designed and made it, as well as when, please let me know. It's a bit weird, but I like it. This collection of stone can be found outside an office block called City Gate by the roundabout at the Derby Road end of Upper Parliament Street. I see it as a beautiful piece of art. Now who could this be in Nottingham? 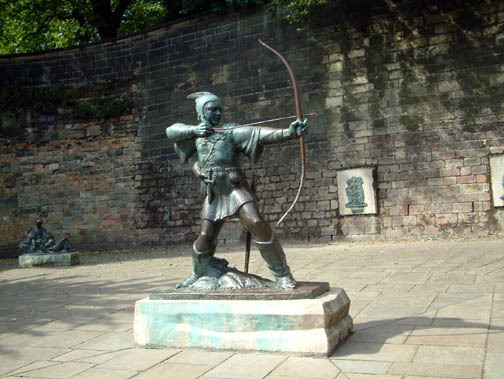 This sculpture by James Woodford, sits in a square outside the walls of Nottingham Castle, and was unveiled in 1952. As a passionate follower of Robin Hood, and over the years a possessor of many things green (yep! I know. I know), the statue sums up for me the story of the man. To football supporters in Nottingham, Brian Clough was/is a god. He turned a mediocre team into one that won the European Cup twice in successive seasons. 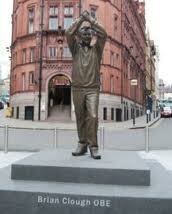 This eight foot high bronze statue, cost £60,000 and was unveiled in November 2008. He was charismatic and controversial, and was known as Old Big 'Ed, and could always be relied upon for a quote. Example: "I wouldn't say that I'm the best manager in the business, but I'm certainly in the top one". 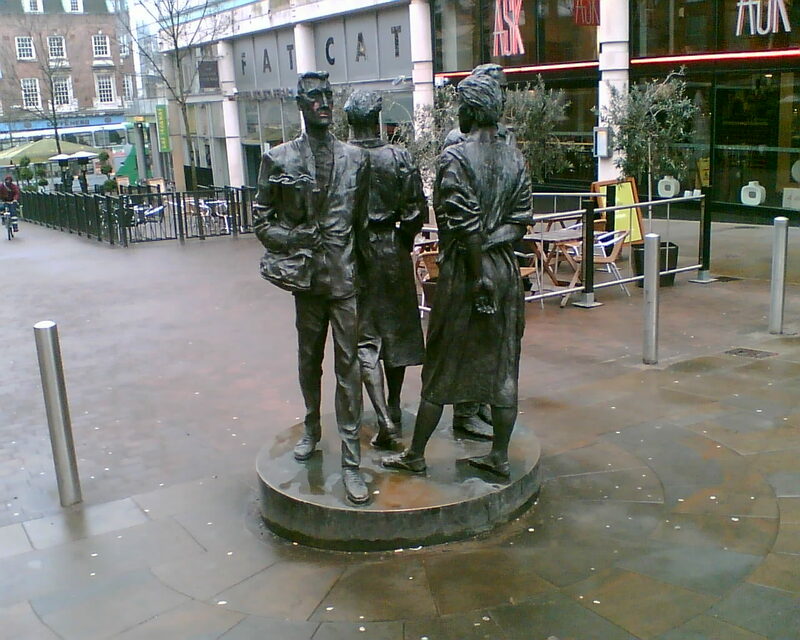 This statue of shoppers was originally sited by the Old Market Square in 1986, but had to be re-sited when the tram system was installed. Sculpted by Richard Perry, it was moved to the top of Chapel Bar which is the site of one of the original fortified gateways into the medieval City of Nottingham. The Lace Market is an historic quarter-mile square area of central Nottingham. Once the heart of the world's lace industry, it has in recent years undergone a renaissance. Nearly all of the old warehouses that were once run down during the recession years have been cleaned and renovated, and have found new uses such as luxury apartments, high-spec offices and academic buildings. During the area's renovation, the Lace Market Square was created, and three very fine metal trees were erected to represent lace. This statue of miners and workers stands against the wall of Nottinghamshire County Council in West Bridgford, and is the work of Nottingham artist Robert Kiddey. Someone, unkindly in my view, dubbed it "The Davy Lamp of love". Others have seen it more like a former soviet workers statue. Whatever, it is a fine piece of sculpture. 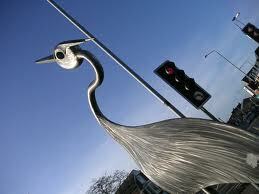 This Heron marks the entrance to the Lady Bay area of West Bridgford, at the start of Trent Boulevard. For those of you who are new to Nottingham, I hope that these pictures have given you a flavour of the City's public art. Those who live here, will no doubt have their own favourites from right across the City. Feel free to let me know what those are.